As a writer in the tech industry, I’m in front of my laptop many hours a day. 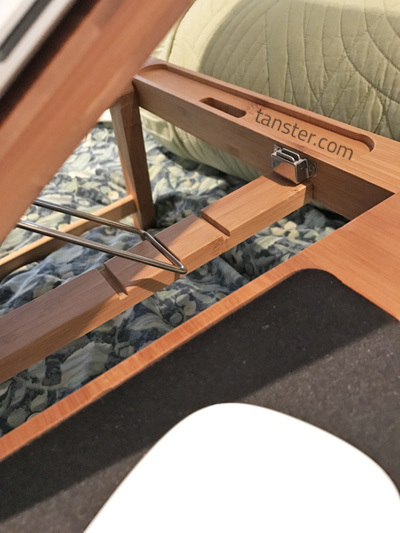 When I want a break from sitting or standing at a desk, I’ll sit in bed and work. 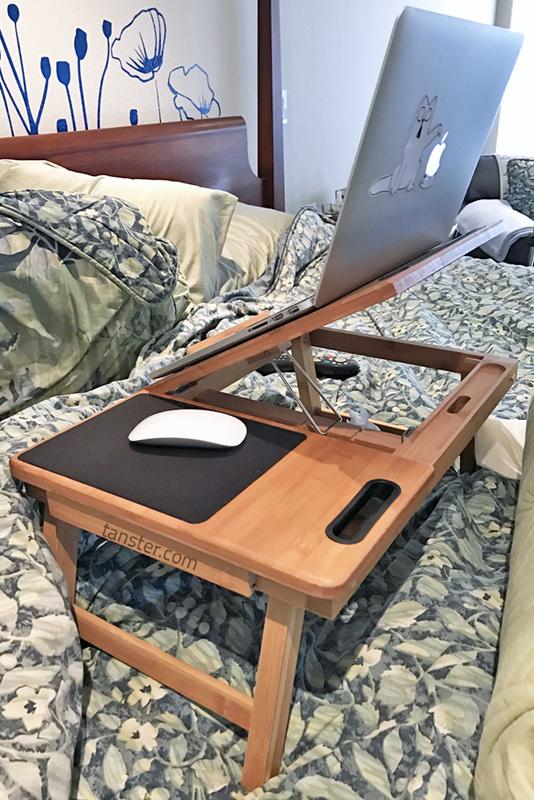 I used to use just a regular ol’ “breakfast in bed” tray, but when I saw the Sofia + Sam Multi Tasking Laptop Bed Tray, I knew I had to upgrade! Here’s what I love about it. 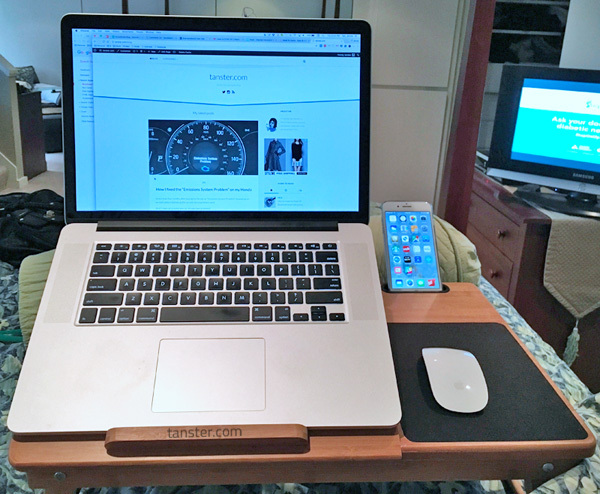 The tray fits a 15″ MacBook Pro quite nicely. Side view, with my MacBook at the middle level of incline. Makes it much easier to type! The incline isn’t just for a laptop computer. The iPad likes it, too! There’s three levels of incline for the main part of the tray. There’s a small drawer on the right side. Handy! First off, can I just say I love this thing? It seriously brings the common breakfast tray into the 21st century. It’s quite sturdy. Getting in and out of bed won’t make the tray (or anything on the tray) tip over. I got it in the Natural finish, which was a little darker than I expected. I would say it’s a warmer tone. Still beautiful, and it matches my bedroom’s cherry furniture just fine! It supports a 15″ MacBook Pro (shown in photos here) with no problems. There are three levels of incline. 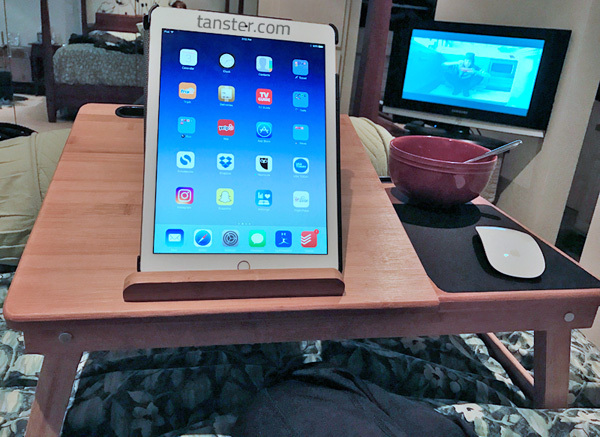 I initially thought I would only use it with my laptop computer, but I find it’s also quite comfortable when I’m using my iPad, too! The slots for a tablet and cell phone easily accommodate devices with cases. Both my iPad Pro 9.7 and my iPhone 7 Plus shown here are wearing cases. The slots for a tablet and cell phone both are open underneath, so you can used them corded. Nice touch! The little drawer on the right side doesn’t pull all the way out, which I like. I use it for pencils and that tiny little Apple TV remote that I can never find otherwise. The mousepad material is pretty nice and slightly cushy when you press down on it. It’s heavier than my old bed tray and therefore a little harder to move around. If you put your iPad/iPhone into their slots, you can’t access the Home button. A bit inconvenient, but not a huge deal for me. As you can see, the advantages far outweigh the disadvantages. Have a question? Post a comment below and I’ll reply as soon as I can. Thanks for reading!